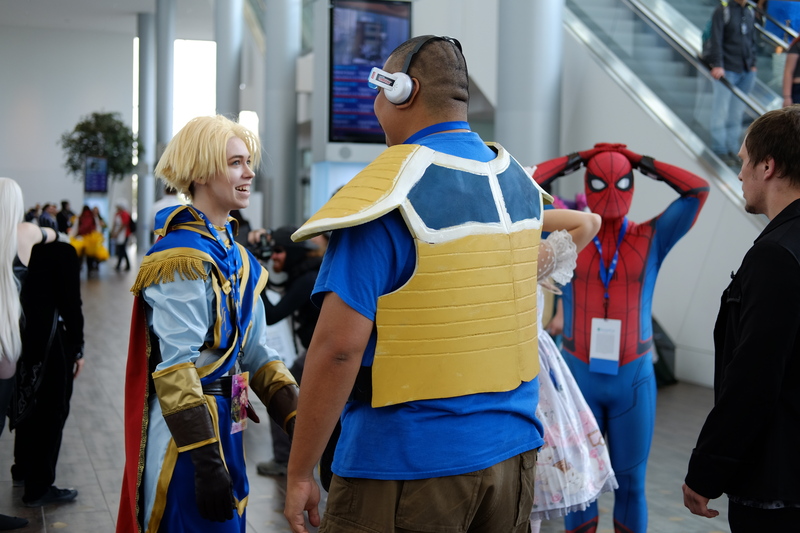 Last weekend, thousands of people poured into Anchorage’s Dena’ina Center for the 13th annual Senshi Con… and at Senshi Con, fandom runs deep. It’s Alaska’s largest celebration of nerdiness and geek culture — everything from japanese animation and gaming to science fiction and comic books. It’s the last day of the convention and Justine Felland just got her first tattoo. “I was like ‘Ahhh! I don’t know if I can do this!’ but I did it, my friends were supporting me and it’s my first anime I really really connected with, so I was just like, ‘I’m going to do this one,’” Felland said. The vendors sell offerings like steampunk jewelry and crochet Pokémon. Even musical instruments. Laura Sexauer is selling movie and video game themed ocarinas. “The instrument itself is thousands of years old, but it’s popular in the modern age because of ‘The Legend of Zelda: The Ocarina of Time,” Sexauer said. Nearby, there’s a video game tournament being projected on a wall while attendees sit at rows of tables playing computer games or tabletop games like Dungeons and Dragons. One floor up, Bernadette Tix is teaching a class on sword fighting techniques. She’s in full medieval garb, roaming between pairs of students facing off against each other with wooden training swords. She’s here promoting Schola Saint George. The genres and interests at Senshi Con might be eclectic, but Tix says it makes sense. Down the hall, there’s a room where attendees can give their costumes a tune-up. Cosplay is basically putting together a costume and spending the day as your favorite fictional character. It’s a big part of the Senshi Con experience. “This one in particular is my first time with this, um, costume people,” Veronica Pearson laughed. Pearson is roaming the convention with a medical kit. She is not in costume, but part of emergency medical services. She’s worked other events at the Dena’ina Center, but not like this. She might not have a clue about what’s going on, but Pearson appreciates the lighthearted enthusiasm of the convention. Fun is why one attendee — who goes by Kane — spent his weekend at Senshi Con. He was one of the first through the doors on Friday. He’s cosplaying as Link from the Legend of Zelda video games. “I’ve been here since day one and all I have to say is that it was amazing,” Kane said. Kane spent the weekend wandering the convention, meeting people, and checking out the attractions. He even bought himself a new ocarina to go with his costume. It’s that kind of instant connection to each other that attendees find so appealing about Senshi Con. It’s a judgment-free zone and a chance to wear your interests on your sleeve, literally. For Kane though, it’s even simpler. “Bunch of nerds. I fit in,” Kane said. “I fit in very well.